Posted on Sunday, September 6th, 2009 at 5:31 am. Description: Get ready to rock! Taiwanese-style! 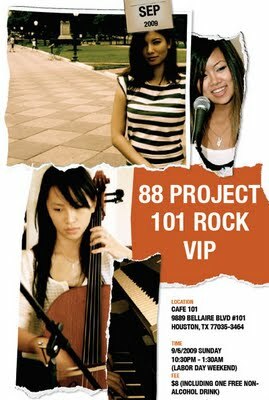 Houston-based band VIP will be covering contemporary Taiwanese rock songs by artists like Jay Chou, Mayday, A-mei… Plus, 40% of the proceeds will be donated to the Typhoon Morakot recovery effort in southern Taiwan. Cost: $8 cover, first non-alcoholic drink free. Cafe 101 is providing a special discount food menu for the night.